The Siege of Vienna by John Stoye is a history consisting of about equal measures of diplomacy and warfare. For anyone interested in why the geopolitical and cultural map of Europe today looks the way it does, the Turkish attack on Vienna in 1683 is one of the defining events. These are troubled times in Europe. Bubonic plague and passages of a comet worry many people. The Ottoman Empire includes not only Moslem lands but most of Southeastern Europe, from Greece and Macedonia through Romania, much of Hungary, and on around to southern Ukraine and the Crimea. Germany remains fractured into many small states. From strong and centralized France, King Louis XIV, the Sun King, His Most Christian Majesty, nibbles off western Germanic states. Stoye describes how the Hapsburg lands of Leopold of Austria — who also is Holy Roman Emperor — are under pressure from both France and Turkey. King Louis XIV urges the Sultan to press Ottoman armies further in disputed Hungary and into Austria. At the same time, French diplomats in the German capitals work to keep those states in thrall to French foreign policy, anti-Austrian and thus by inaction, pro-Turkish. By decree ... the old usage was revived of "Bells for the Turks," the "Turkenglocken." Bells started to ring every morning through the city and the whole land of Austria, summoning all to kneel and pray for deliverance from the invader. In July, reinforcements begin trickling into Vienna for its garrison and the Austrian field army. Yet the foremost Ottoman raiders now appeared, and in the distance the smoke of burning villages in the neighborhood rose skywards. The most obscure period of all is the week before the siege began, partly because neither the Estates nor Leopold's [Imperial] government had bothered to put into working order the ancient defence-system, which flashed warnings of an enemy attack from beacon to beacon across the hills. The beacons were not laid, so that no one knew, and no one could record, the routes followed by the Tartars. There is considerable devastation to the Austrian countryside. Stoye provides a map of Tartar raids in Austria, where the Crimean Tartars loosely under Ottoman command raid not only south but west of Vienna: "Places underlined were stormed and taken." The book includes an evocative illustration of Tartars easily crossing a river in several divisions: the women captives, tied, are rowed in small boats; other prisoners are tied to the tails of horses; Tartars float equipment across on bundles of reeds; and spare horses are herded across separately. Vienna itself is protected by substantial walls (lately strengthened), and has laid in good provisions. The Ottoman army does not have major siege artillery with it, so they rely on well-planned trenching toward the walls, and then successfully tunnelling under them and exploding mines. There is fierce and prolonged fighting. It is a close call whether the movement of reinforcing armies from German lands — Franconia, Saxony, and Bavaria — and from Poland, will reach Vienna before it is stormed and overrun. Leopold's diplomats continue asking for assistance. Able defending commanders include Starhemberg inside Vienna, the Duke of Lorraine with the Imperial field army, and King Jan III Sobieski with the Polish army. Persistent official pressure now forced all house-holders to provide themselves with buckets, barrels or skins, kept filled with water; and they had to dismantle roofs made of shingles, in order to lessen the risks of fire. But there were fires, and more companies of fire-fighters were formed to deal with them. Other instructions dealt with the scouring of the streets, the removal of refuse and of dead animals; while paving-stones were dug up, partly for the reason that Turkish shot did least damage if it fell on soft earth, partly because more stone was needed on the fortifications. The Pope, Innocent XI, tries to persuade King Louis XIV to have the French fleet attack the Ottoman Empire in the Eastern Mediterranean to relieve the Turkish pressure on Austria; Louis XIV refuses. In fact, his diplomats in Poland and a number of German capitals continue to press those nations not to send troops to the relief of Vienna. During this period, the navy of King Louis XIV tries and fails to take the Moslem pirate base of Algiers; but his army captures Luxembourg. The ongoing diplomacy, complexly obscure at first, takes on the suspense of the actual warfare in Austria and Hungary, and especially of the siege of Vienna itself, as the war progresses. John Stoye's The Siege of Vienna is an excellent history. 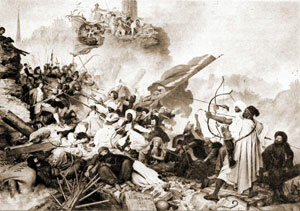 Der Sturm der Türken auf die Löwelbastei by Leander Russ, 1837 (The Turks Storm the Lowel Bastion) is taken from a 1903 postcard printed by J. Loewy in Vienna. This illustration is courtesy of postcard collector Kathleen Isabell, who shares online many rare historical and topical images. The original of the Leander Russ painting is in the Österreichische Galerie im Belvedere, Wien. It is a rare campaign or battle which later centuries still remember as important; vastly rarer one which represents a living issue: Gates of Vienna.